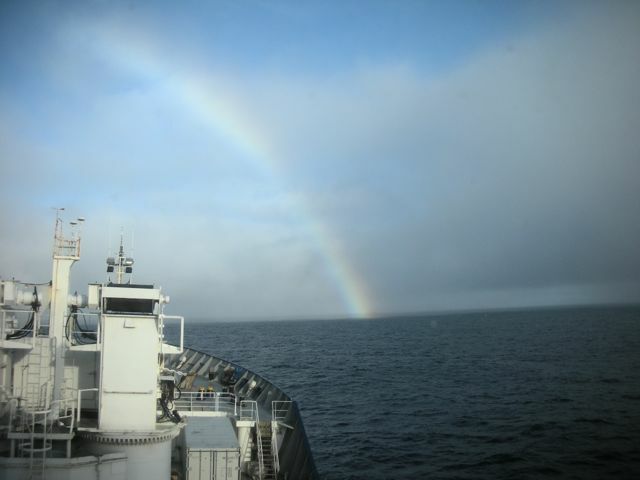 This blog will record the activities and insights of life while at sea in the Subantarctic Zone, while chasing the Spring phytoplankton bloom, as experienced by Leanne and Veronica. Please note that the blog entries have been posted from the end of the voyage, at the top of this page, to the start of the mission at the very end. 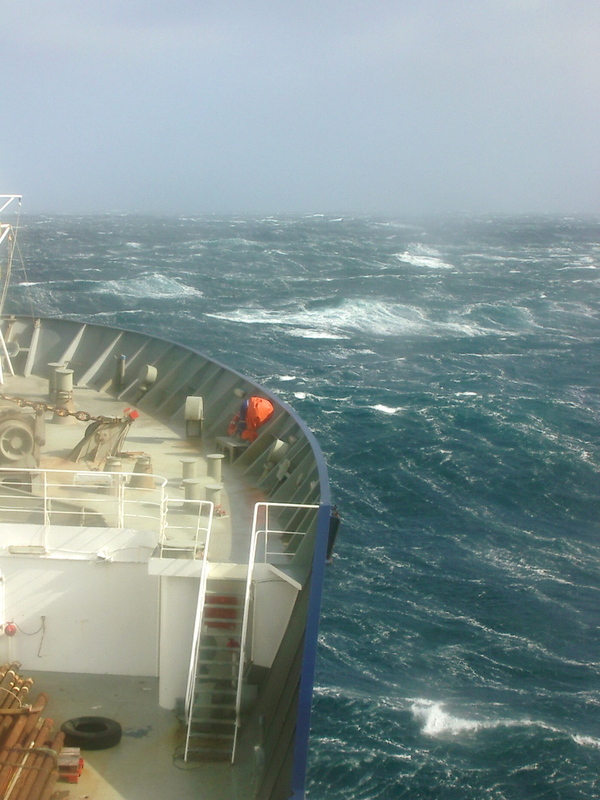 The R/V Marion Dufresne riding Southern Ocean waves. Photo L.Armand. It seems very odd to be writing the last entry for this 2-month mission and adventure at sea. If you plot our position today you’ll see we have made some progress since my last entry, we are now at the latitude of 30°20’S and longitude of 61°28’E. We are still cruising along at a steady pace of 14 knots along a bearing of 340°. The wind is from the northeast today with an average speed of 13 knots, with the occasional gust up near 20 knots. The air temperature is a sweltering (well it feels that way to us) 20 °c outside. The air conditioning has gone on to replace the heating of the last weeks. The seawater temperature is now 21.2°C, positively tropical! In following up on the report I did from the galley on Wednesday, the other very important part of the meal service on board are the team that serve and clean up after us in the dining room and in cleaning our cabins. As you will have read before this team is headed up by the Maitre d’Hotel Jean-Charles Herve. The rest of the team include Romuli Andriamialy, Dany Stephano, Clement Fahvia, Maminiaina Raharjaona and Emilian Chow (see photos). Emilian is our very friendly barman. It is these guys that have made us welcome each day with good humour and big smiles and in some ways made life aboard for us during the mad hours of sampling day and night less stressful. When you throw in the work of the work crew on the outside, it is the ship’s crew together that are the life support behind the work we do. I haven’t had to think about anything but my science, getting to meals and making sure I do my washing (out of socks again!!). The rest of the cooking, cleaning and hard work on the decks was completed by others on my behalf. In this respect I am fully grateful for the work that they do (and should they read this I thank them again). I also want to thank the outside crews who deployed my phytoplankton net and the CTD’s (Team Felix (Baba, Thierry R., Patrick, Daniel), Team Gé-Gé (Thierry V. Jean-Claude, Eugene, Boris), Team Ruldophe (Joe, Denis, Jean, John) and also Richard, Marcel, Sorin, Peter-Theodore, Vic and Stellean who came past the microscopy lab to away say hello. I also need to thank my trusty Lieutenant Flavian and Captain Bernard who have answered all my questions (or Mr T’s class’s) or suggested things to add to the blog each day. Last night the Australian team (along with some of the French scientists and Chief’s of mission Bernard and Stephane) were invited to eat chicken curry with the Madagascans. It was a relaxed and fun meal together, we got to find out a lot more about their country and which regions they all come from. There was some Australian wine on the tables (courtesy of Tom and Andy and Co.) and I held a mini trivia quiz on Australia with a bag full of Aussie goodies for the winning team. I think there might have been a little bit of cheating on some tables given the answers given, but who would have guessed that they thought a wombat was a snake, that Tom Trull is our Prime Minister and that the phrase Aussie, Aussie, Aussie should end with go, go, go! After the meal there was dancing to Madagascan music and later the usual dance music in their entertainment room. The place was packed. It was a fun night and I think ended early this morning. We are now having a scientific meeting everyday at 2pm. We have 4 people or groups presenting their preliminary results at each meeting. Yesterday I presented the preliminary results of the diatoms I have been looking at the last two months and their abundances across the region we studied. Veronica is the “Queen of database tabling” having completed a thorough database of all the samples that we’ll be bringing back to study at Macquarie University over the next year. We will finish packing all our samples and laboratory material today I expect and then it will just be our own bags of clothes. I also have the mission report to complete. Hopefully all of this will be completed by Sunday afternoon. Normally we should arrive on Monday in Reunion after a short detour to Mauritius to drop off and pick up various crew and scientific staff. By 12 noon on the 30th November the KEOPS2- mission will be officially finished and we will have all left the ship. Some will go straight home that day, other the following day and others still with stay and visit Reunion for a few days or even a week or two. Well, I best get back into packing things up. I hope that you have enjoyed travelling to the Southern Ocean with my scientific colleagues and me on the KEOPS-2 mission. I hope it gave you an insight into the work that occurs on a scientific marine mission and how we go about studying the marine environment so that we understand what goes on in our oceans from the biological, chemical, physical and geological perspectives. All of these sciences are integrated, as are the scientists from around the globe that work together on building this picture so we make wise decisions about the way we see and use the ocean. This science is exciting and we will all be working together over the next year, and possibly even longer, on the samples we have collected these last two months. Marine science is fabulous, there is so much still out there to discover and understand and working at sea with an international team of scientists is an amazing experience. There are couple of people I really need to thank for persevering through the last 2 months with me: Veronica my fantastic techie and CTD sampling queen, and Diana who shared the cabin with me and wrote a few of the blog enteries. There is also the rest of the Aussie team (Tom, Andy, Pier, Fabien and Manu), our Chiefs of the mission Bernard Quéguiner and Stéphane Blain, but also IPEV’s Pierre Sangardi who did a lot of behind the scene work. But finally all of the Scientific personnel on board thanks for a fabulous mission- I’m ready for KEOPS-3 in 4 years time. PS. Looking forward to seeing Mr'T's class soon to talk about this adventure and to deliver your very small cups! P.P.S. There are two new movies on animals (Penguins, Elelphant Seals and Albatross) that I saw on Kerguelen Island last time I visited in 2005 for you to look at on the Movies page (if not now, very soon). The galley and well on our way. Today we are now well northeast of Kerguelen, in fact we crossed the Subantarctic Front yesterday around lunchtime and are now in Subtropical waters. The ship is steaming along 15 knots on a bearing of 343°. The wind is bearly worth reporting at 6 knots from the west. The sea is so calm and flat that looks like quicksilver. Our current position is 40°38’ S and 66°11’E. The sea surface temperature just south of the Subantarctic Fronts was 6°C, whereas now we have sea surface temperature of 11.9°C. The air temperature outside is 12.4°C. Already I have seen people are wearing their shorts and t-shirts again. I’ve already washed and dried our yellow freezer suits. They will get packed away today. In fact everyone is in pack up mode and report writing mode now. A few teams are finishing up their sample analyses either today or tomorrow. In fact there is still one more Trace metal CTD to go sometime tomorrow. Yesterday we started a daily scientific meeting (2pm) where each team will go through their preliminary findings (4 people per day). I will provide one in a few days time, when I have plotted up the major species I have observed at each station. Otherwise right now Veronica and I are now in full pack up mode. Veronica is finalising the database of samples taken from all the CTDs, I’ve done the sediment samples and all the net samples. We need to have everything listed for quarantine when we enter Australia. Next will be the rest of the equipment boxes. As promised I have also made a visit down to the Galley to talk to Claude Cornet the Head chef on the Marion Dufresne. Claude has been working on ships for 28 years, and so has visited many continents around the world including the USA, Africa, the Antarctic, South America and Asia. He has been working for the company that services the Marion since 2006 and has made several voyages on the Marion now. This is one of the longest missions though. He tells me that he prefers working on passenger ships because he gets to work with a team and also gets the opportunity to talk and receive the positive feedback of the people on board. When he has worked on container ships, he ended up working alone and sending the food up to the workers who he otherwise didn’t get to meet. On our mission there are 120 people to feed each day. Claude works from 6am to 1.30 pm for the lunch service and then 3.30pm to 7.30pm for the dinner service. One of his team gets up at 5am each morning to cook the bread for us. Each day Claude has a menu prepared that his team put together. Although the menu is somewhat planned in advance, he sometimes need to change it due to the weather conditions. There is no point having soup when the ship is heading into extended bad weather. Each day one of the junior officers comes down to the galley to obtain the final menu and then heads off to print it out, which then is placed on our tables each day with the daily announcements related to activities everyone needs to be aware of on the ship. Today Claude and his team (Roger Rakotonindrina, Olivier Rakotoniaina, Patrick Rakotonandrasana and Nicolas Rasamoelina - see photo) are preparing a lunch of creole octopus for the entre, 23 kg of steak (= 250gm per person) with a mushroom sauce and French fries for the main course and then a dessert of a cooked coconut custard (more photos from the kitchen soon). So here are some facts regarding the food on board. For this voyage we have two semi-trailers worth of food delivered to the ship. 200 kg of this was cheese and there was 600 litres of milk. We drink 16 cartons of water a day (1 carton = 12 x 2litre bottles) and consume ~40kg of meat. We eat around 90 bagettes per day and when ice cream is served for dessert we eat 25 litres in a service. Claude was able to preserve the lettuce for 3 weeks after we departed from Reunion Island by keeping it in the fridge but well away from the ventilation. We have no fresh food left aboard now, except apples and oranges. As you will have recognised from some of the previous blogs there are certain days that certain things happen, such as the croissants on Saturday, chocolate croissants on Thursdays, Sunday lunch the special meal. Claude explains that this is important to preserve when on missions such as these where everyone is working hard and sometimes lose which day is what. It is also good for the morale of everyone on board, it is also why we always have desserts at lunchtime. Well with all of this talk of food it is time for me to get ready for lunch. Tomorrow will be my last blog entry, as I my time will be taken up by packing and writing the mission report. KEOPS2 finished and Kerguelen: So close and yet so far. Yesterday we finished our last station. We picked up the last instrument from the water, conducted the last CTD and to wind it all up for the KEOPS2 mission I completed the last deployment of the phytoplankton net. We were lucky to get the last net sample because as the net was being brought back on deck a large wave came through and the net opening was hooked up on to the cable. Thankfully it didn’t tear the net too much, just punch a hole near the top. We retained all of the sample in the net and into the cod end. Last night in the entertainment room we were all gathered together by the Chief Scientist on board, Prof. Stéphane Blain, for a speech directed at thanking specifically all the Ships’ officers and crew by the scientific team. An aperitif offered by Prof. Blain followed his speech. The other news we were greeted with was that we’d be at Kerguelen Island tomorrow (49°22’S, 70°12’E) for a day on the island. We would also be picking up one person from the island to return them to Reunion Island with us. This morning we got up early ready to disembark from 6.45am. Looking out my porthole window I could see it was overcast and we had waves in the bay. The base of Kerguelen was no more than 500 metres away but I could see the waves breaking against the port quay. It didn’t look too good. Still everyone was getting ready, packing their picnic lunches, getting all their cold weather gear and sturdy boots on. We had a specific plan for the order of getting off the Marion Dufresne onto the Kerguelen Barge (through the side door of the ship) call L’Adventure. I went to the disembarkation door to see that the wind and waves were really too much for the Captain to let anyone off the ship, the wind was bring foggy conditions and snow with it. By 10 am the winds had increased to 41 knots, the outside air temperature was 2.6°C and the day to Kerguelen was cancelled. We would just wait for the person who needed to come on board the boat to arrive and we would be off. I am now up in the bridge and have seen the anchor be pulled up and we are no heading off to Reunion Island. The wind is has been gusting up to 52 knots. 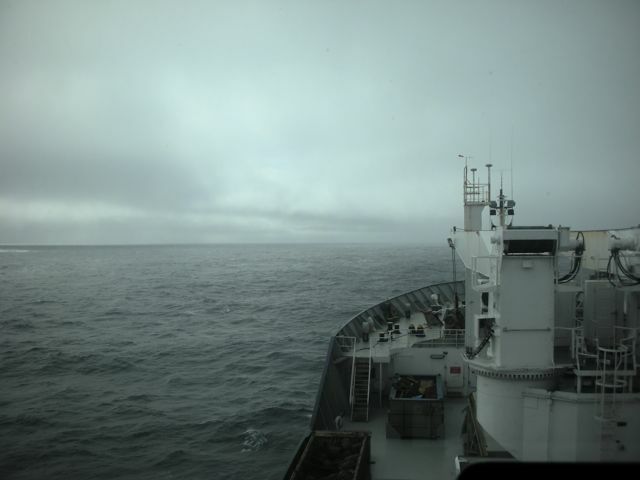 we can see bits of Kerguelen Island as we head out through the rapidly moving foggy conditions. Many people are very, very sad not to have been able to get off the ship to explore Kerguelen, see the baby elephant seals and explore the base, even though they realise the weather and wave conditions were really far to dangerous to make the excursion possible. We can not stay here for more than one day as we now have a lot of ocean to cover to return to Reunion Island on the evening of the 29th November. So with our new Kerguelen person on board we are heading out of the Bay of Morbihan and northwest to Reunion. I am reasonably sure everyone will be very quiet for the rest of the day trying to hide their disappointment, it will also mark the point where everyone will start the packing up of the labs, the writing of the mission report for the samples taken by each group. We will have a few Scientific meetings where everyone will be expected to give a summary of observations to date, and finally we’ll discuss when and where the post-cruise meeting will be in a year’s time and what we’l need to accomplish for the publication of results. Tomorrow I will make the tour of the Galley and send you a report. We are now halfway through the last major sample station (Latitude 48°25’S, Longitude 71°53’E). With the weather still on our side (31 knot winds from the northwest, swell 1.5m, 4.9°C air temp and 3.4°C sea surface temperature), and all equipment deployments working like a well oiled machine, we should be finished by this afternoon and then heading off to the east to pick up several long term deployments. This still remains a little like a game of hide and seek even though we have a variety of messengers sending back the equipment’s location in the ocean. I am sure there will be a lot of eyes up on the bridge helping to locate the flashing buoys. The sooner we locate them and get the equipment back on board the sooner we can head to Kerguelen Island. There are many people looking forward to stepping on to land again and for many it will be their first time to visit Kerguelen. I have been fortunate during two of my previous missions on the Marion Dufresne to have spent some time on the island already. I also know that I should bring warm, wind proof clothing because it is a subantarctic island after all and outside can be quite cold because of the wind chill factor. With the visit to Kerguelen in the back of everyone’s minds it also means that the sale of stamps, envelopes and postcards will hit a high again. Our Maitre d’hôtel, Jean-Charles, will have a busy afternoon selling such items (photo) as this is the past chance to have the post stamped at the Kerguelen post-office. I have also sent for posting up some photos of the seafloor critters that we collected at the Multicore station no 6. You will see worms that have made sediment tubes up and out of the sediments and others that we observed in the upper 3cm of the sea floor. There is also a photo of a very small sea star (~2cm diameter) on the surface of one of the retrieved cores. Marie-Lise also found another worm 20cm down in one of the mutlicores she was slicing up that was a big as a large as a shelled peanut. We know that it had increased to such a size because it was no longer under the overlying ocean’s pressure and thus essentially had blown up like a balloon as the gases in its body expanded coming to the surface. We don’t have any invertebrate specialists on board so I cannot tell you what the names of these worms and sea stars are called. I also cannot bring them back to Australia to be studied by a taxonomic expert because I do not have a Quarantine import for this sort of biological material. Bit of a shame really but one has to follow the rules. I also did my 25th and 26th phytoplankton nets yesterday. I have posted some photos of the net coming out of the water with all the phytoplankton still visible draining down the net into the cod end catcher, and also a photo of the phytoplankton that was caught in the cod end, followed by a general scene of what this actually looked like under the microscope with a large variety of different species of phytoplankton. Can you pick out the Eucampia antarctica chain? The green you see in most of the cells are the chloroplasts that allow the phytoplankton to photosynthesize with the sun’s energy, converting carbon dioxide and water into sugars from the phytoplankton and oxygen for us to breath. Tomorrow I hope to have a report from the Galley for you to read about. Today a quick return to station E1-4-W to take a trace metal water CTD (which was completed early this morning), and Multicorer again (that is currently going down 1.5 km to the sea floor for more sediments) and maybe if I am lucky with the time on this station a phytoplankton net haul for me. It really is beautiful outside today. Clear skies, not a cloud in the sky, calm seas once again. It feels like 10 degrees outside but in fact the air temperature is 3.6°C. The sea surface temperature is still 3.2°C like yesterday but further south from where we are now. We are currently located at 48°46’S (latitude) and 71°25’E (longitude). The wind is from the west today and has a average speed of 21 knots. The swell is around a metre with a periodicity of 5 seconds. There are a lot of sea birds hanging around at the moment, they tend to get excited when we put equipment in and out of the water, but especially so when we put any of the nets in. So today I have posted (or very soon - thanks to Arun for putting the photos up for me) a plot of the current drifter deployed for Killara Primary School (called Eucampia). Dr Meng Zhou’s map shows us all the drifters deployed to date and insert into this map is the trajectory of the Eucampia drifter since the 9th of November. As you can see it started out near the shelf (that is the region between the raised plateau on which Kerguelen Island sits (green tints) and the deep sea (blue tints) - the depth scale in metres is on the side of the map). As you can see the Eucampia drifter has headed northeast. Can you guess why it went this way ? In fact you will see that most of the drifters have gone this way. In part the current is taking them this way, but the main reason why a lot of the drifters have headed northeast in the last few days was because of the big storm and the 55+ knot winds that blew them this way. Did you guess this? I will post another plot in a weeks time to show you where it is again now that the currents are driving its trajectory instead of the big storm. Yesterday afternoon I mentioned that we would take a multicorer of the seafloor. This was very successful. What was most interested though was to see so many worms in the top layer of the sediments. I will post photos on this tomorrow (sorry haven’t taken them off my camera yet). One worm even popped out of the sediment and was swimming in the water of the tube! It was fascinating. As a scientist though I have to think about the consequences of this biological activity in the surface of the sediments, because when I undertake my research on the fossil composition of these sediments I have to consider that the surface is always being disturbed to a certain depth and that there isn’t any direct layering. In other words if a 1mm layer of sediment was deposited each year and the worms are mixing it down to 3cm then I have to conclude that 300 years of sediment deposition has been mixed up within those 3cm. It makes reconstructing a history of sedimentation by the fossil diatoms a little more difficult as it averages out the changes that m 18 Novay be happening over that 300 year time scale. Well I need to stop here as the next multicorer is due on deck, which I help with transporting down to the cold room for analysis by Marie-Lise from the University of Bordeaux. I then will have my phytoplankton net to deploy and then we are off to the next long station. We will have two days there and it really will be the end of sampling for some groups. It also looks like we will be going to Kerguelen Island for a visit on the 21st of November- everyone is super happy about this, especially after missing out early on in the mission. CTD no 100 and one major station to go. Yesterday the 100th CTD was deployed and celebrated by the CTD water collecting team at station A3-2. They sent a bottle of champagne down with the CTD and then enjoyed a small glass each in its arrival at around 9am (Photos). A visit from Emperor Palpatine (Dr Dominique LeFevre from the dissolved oxygen sampling group and also the deployer of the “YODA” equipment) made the event extra special. The CTD team have earned this reward as they have been up at all hours of the day and night since the start of the mission sampling the water from the CTD and then processing them by filtering, fixing, incubating or chemically analysing many hours after the sample was taken. Today is the last day of sampling at A3-2 (latitude 50°38’S, longitude 72° 30’E) and there is one more Multicorer for the sea floor sediments to be deployed and recovered. We have to be careful where we deploy the Multicorer as we don’t want it to hit the long-term sediment trap equipment that is moored on the bottom of the ocean in the same region we are sampling now. After today’s station we head to a location where we need to repeat a trace metal water profile of the water column for a few hours and then head further north again to our last E1 repeat station. We will again stay there for ~2 days and deploy everything for the last time. The ocean after the storm (I forgot to mention that we actually had gusts up to 63 knots with an average of 57 knots during the peak of the sorm) has returned to the very calm conditions we have been fortunate to experience since the start of the mission. Today we have grey skies with thin wisps of blue sky in the distance. The winds are from the northwest at 17 knots. The outside air temperture is 3.2°C, which is actually warmer than the sea surface temperture at 2.4°C. Our friendly Lieutenant Flavian tells me that we should have good conditions for the remainder of the mission. More tomorrow on the whereabouts of the Killara Primary School current drifter called Eucampia. What a ride we had last night. 4O knot winds, lots of riding the waves and feeling the shudder of the ship as we coast over one wave to pierce through the next large one. The fixtures of the ship creak and moan, you really have the impression that you are on a ship. Last night most people joined the Madagash (people from Madagascar) crew for a bit of Karaoke sing along and then some dancing to their traditional music. It was a fun night and made more so with the rolling of the ship in bad weather. It was a good way to pass a few hours instead of thinking about the storm outside. To sleep last night was interesting as well as one really did need to wedge ones self to the side of the bed with the wall so that you could sleep without rolling side to side. Some people stick their blankets under one side of the bed so they are wedged in. It really is hard to sleep if you are constantly moving side to side. Today we still have reasonably difficult conditions outside but the worst of the storm has passed. Since lunchtime we have started to head back down south to our A3 station, a station we sampled a lot in 2005 during the KEOPS-1 mission. This location will be sampled again to give us some perspective on the early bloom conditions at this site in contrast to the end of the bloom conditions we studied before. So we are in transit right now currently maintaining a speed of 6 knots on a 182° bearing. We are located at 49°47’S and 71°56’E. The wind is still at 35 knots but now from the southwest. The air temperature is dropping as you can probably guess with us heading north. It is now a chillier 1.8°C and today I have my jumper back on. The sea surface temperature is 2.1°C. We should be on station by 10 pm and will of course start sampling if the wind has died down a bit with a CTD cast and bongo nets for zooplankton. My phytoplankton sample will be the following morning. I am hoping conditions do die down a lot as doing microscopy when the ship is moving around so much is difficult, but certainly not impossible. I guess I could call it “extreme microscopy”. As for the rest of today I’ll be doing a bit of photography management of all my diatom images and attending the next scientific meeting at 3pm. I will send some photos of the weather conditions captured by others and myself in the next day or so. We are at the end of our long-term repeat station. In a few minutes we’ll be heading closer to Kerguelen instead of down to our next station. This is because the big storm that we’ve been told is coming for a few days now is in fact on its way. it will take us around 3 hours to get there. So our position now is at the latitude 48°43’S and longitude 72°33’E. The wind is 30 knots outside from the north - northwest. This is the direction that the ship is facing. The air temperature is still a warm 5.3°C and the sea surface temperature is 3.3°C. The skies are getting grey and the ocean looks agitated and dampened by the wind. The swell is only 2 metres with a periodicity of 5 seconds. Actually the rain is staring to come down now. Yesterday there was a lot of sampling undertaken for the trace metal scientists, so lots of pumping of water from different depths. We had a major failure of one instrument on the CTD - water appears to have got into the connection plugs and so we lost connection to it. On a test run later in the morning it also fired incorrectly so the technicians from INSU in France worked on getting it back together for most of the afternoon. By last night it was all working Ok again and the CTD sampling continued into the night. I took a phytoplankton net sample around 11am yesterday and it we bought in a lot of material into the cod end (photos). There were a lot of Eucampia antarctica coiling chains (photo) and several other diatoms, as such we are now starting to see the bloom take off as the different water masses of the ocean start to mix in this repeat station we keep coming back to. If the storm is short then we should be back out to our repeat station for a fifth time. It will be interesting for me to see how the community continues to evolve. The storm will certainly mix the surface waters a lot deeper and this will bring more nutrients to the surface that will help boost the bloom. Just think how a vegetable patch likes to have the soil turned over and extra fertiliser added from your compost bin or worm farm. The same thing can happen in the ocean because of the mixing action of the storm and currents of the ocean. 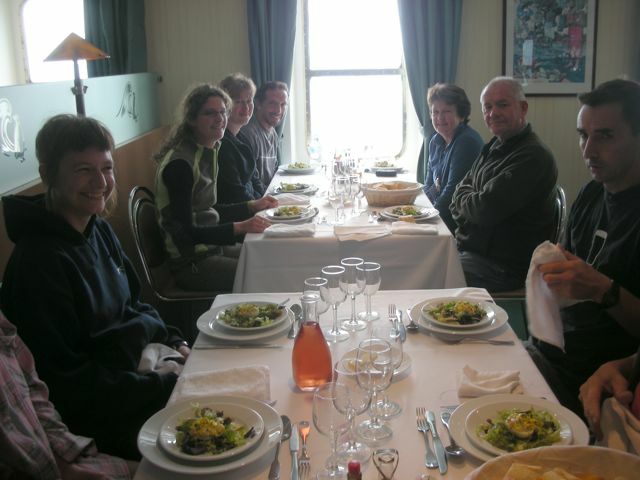 Yesterday was also the special Sunday lunch on the ship. I think the second sitting of lunch was full. No-one wants to miss out. For entrée we had a plateful of prawns with a hollandaise sauce, they were certainly tasty. For the main meal we had duck a la orange with pomme noisettes and green beans. It was really very good and I think there was nothing left on anyone’s plates except the bones of the duck leg. The round of cheeses was next and for dessert we had a choux pastry called a Choux de Valetin. Basically a small choux pastry on top of another bigger choux, both filled with vanilla custard and topped with a small amount of whipped crème and almonds to hold the two choux together. Again there all plates were cleaned of their pastry by the end of the meal. I found it very hard to get back to work on the microscope after this meal. I am sure there were a few who had an afternoon snooze to digest it all. Well, that’s all for today. I hope to catch some photos and videos of the storm conditions from the bridge to show you tomorrow. I also better check that everything is attached well in my lab and cabin, since this is usually when things get tossed around. Today you have a blog entry from Veronica about the Ships’ hospital that she took a visit to (for fun, not because she was sick). There are some photos to show you what it is like. The doctor, Dr Xavier Beyer, organised a tour of the hospital on board for those interested, so I went along to have a look on the 5th of November at 5:45pm, local time. I had been there on previous occasions in my seasick days, though was able to appreciate it much more as a visitor. reproductive organs from the radiation. The X-ray image is developed by the Doctor as well in another room, a make-shift dark room, with instructions on the wall of how to do it and the chemicals necessary. Like most dark rooms it contains a red light that has been made by wrapping a light globe with red sticky tape – a bit of a fire hazard, in my opinion. In the odd event of surgery required on board it would be carried out while the ship is stopped close to one of the Islands we are closest to at the time – Kerguelen, Crozet, Amsterdam or St Paul. This is so that the doctor on the Island can come on board to assist. The doctor also communicates to the hospital in France that the surgery, whatever it may be, will occur so that other doctors are aware and advice can be provided where needed. To perform the surgery there is; an operating table that is fully adjustable, with a light above, that is also adjustable, in height and position. Anaesthetic and a machine that monitors the patients breathing and heart rate while under anaesthesia – a tank of oxygen is connected to the machine to help the patient breathe. There is a suction unit, metal drawers, that are numbered for identification, filled with operating gowns and the tools needed for different types of surgery and if things are very bad a defibrillator that is semi-automatic (the shock needs to be administered by the doctor). Sterilisation of tools is very important after and before surgery and so there are 2 types of autoclaves, one dry and wet. If a patient is unable to be moved, there is a kind of sleeping bag that is placed underneath and around the patient and is filled with air to immobilise them as much as possible. There is also a stiff board to aid in this. There is an automatic blood pressure measurer, as well as the manual sort – as was used on me- and an eye bath. The pharmacy on board is next to the hospital with shelves and shelves filled with medication to treat all sorts of ailments. the bed labelled medicine. The button calls the doctors room next door so he can attend to the patient. So while surgery and being sick at sea is the last thing that anyone wants to have happen, the Marion Dufresne is prepared. So the weather is far from being in our favour now. Overnight we had 40 knot winds and so the ship was positioned to face into the waves and we spent the night going over them. This morning the winds have dropped to around 35 knots from the west, and because the winds flatten the surface of the ocean (but not the swell which is between 5-10 metres) we will do some test deployments. This includes a CTD cast of the surface waters and my phytoplankton net. I am a bit worried that the net might be taken by the big seas after all it is only a little net. We have a spare, but I would hate to see it disappear though. We are currently on our repeat E1 station at 48°46’S and 71°25’E, this is the 4th visit to the same body of water, although this water body has split in half and we are now going to study both regions of where this water has been taken by the currents. The water temperature is 2.6°C here and the outside temperature is 3.6°C. The sky is a beautiful blue as the wind has blown away all the clouds. I have to head out now to take my phytoplankton net. More soon. Well perhaps I spoke too soon. My phytoplankton net went in to the water and came back in but with a huge rip through one side. The cod end still had phytoplankton in it so we know that one of the swell surges combined with a burst of the rear stabilisers that steady the ship on location assisted in the net tearing on the way out (photo of ripped net to be posted). I quickly retained what was left of the sample from the cod end collector (placed it in the cold store to look at later) and got to work on stripping the old net off the girdle ring that holds it open and the cod end attachment so that a ne net could be put on and that we could sample again in the quickest time possible. It took myself, Veronique Cornet-Barthaux and Gilles Rougier an hour to get the new net ready. The Bongo and Multinet were being deployed so I quickly ducked off for some quick lunch at the first sitting and then I was back out on the rear deck ready to deploy the new net. Conditions hadn’t necessarily improved but the Second Captain, Matthieu Porcher, had already planned that the rear stabilisers wouldn’t go off as we were pulling in the net. So with crossed fingers we sent it back down to 100m and back up again. As it came back up I could see it in the water column with 10 m left to go , it looked Ok, but as it came up it looked strange the girdle ring was on a slant although the net was complete and I could see the phytoplankton staining the base of the net green as it filtered out the water and retained the phytoplankton (whew!). I thought the ring had been bent but as it was winched back on to the deck we could see that one of the 3 ropes that attaches to the girdle ring had somehow looped itself on to the cable wire end and thus tilting the ring. We have no idea if this happened when it went down or on the way back up. Nevertheless it was a very successful deployment and I now have sample to look at for the rest of the day. So much has happened this last week I have actually lost what day or time of the day or night I have been working or sleeping or eating. Some days had no night, breakfast was at lunchtime, and there was a small storm in the middle of it all somewhere. The only thing that seems regular anymore is the times that lunch and dinner are set for, which are announced over the public address system. We have completed 4 stations since I last wrote, some of them we have had to pull out of in the middle of sampling as the weather conditions and particularly the waves were getting too big to safely deploy and recover our equipment. I have managed to collect phytoplankton net samples from all the stations, but it was very tricky trying to do the microscopy work while the ship was moving so much. We have however been smack in the middle of the major phytoplankton bloom at last and this is why we have been so busy. I look at a lot of the scientists on board and we all look very tired now. It is strange to think we have been going hard at it for 5 weeks non stop and have another 10 days to go before we start to head back to Reunion Island. I know we will all be looking forward to doing nothing for a day or two. Our fresh food is now pretty much exhausted. I think there are only apples, oranges and few pears left in terms of fruit. There are no more potatoes. Still lots of carrots; which turn up on our plate once a day. The food still is excellent and Claude the chef is doing a great job. Yesterday we had Guinea fowl with vegetables (carrots and peas) and something similar to pomme noisettes for the main course and then chocolate éclairs for dessert (they were delicious). There was of course the selection of ~8 cheeses to pick from. I don’t think I can eat any more cheese…. I have two entries to add to today’s blog that will have accompanying photos. The first is a summary of the Australian night by Pier van der Merwe from ACE CRC with a few photos of the Australian Team and everyone gathered in the entertainment room (provided by our doctor on board Xavier Beyer. The second one is from Dr Meng Zhou who has been deploying current drifters during our voyage. I deployed one (see photos) that is now associated with Killara Primary School (called Eucampia antarctica after my favourite diatom) that we can follow to see where the current takes it over the next year. I have also had added two new responses to the Q&A section of Mt T’s Grade 4 class if people are interested in reading this as well. Before I add the two reports I’ll give you our current position and environmental conditions. Ship speed :1 knot (because we are currently picking up one of Tom Trull’s sediment traps from the water before steaming to the next station 5 hours away). The sky is a light grey with patches of blue sky, better than yesterday when it was cold, windy, raining, foggy and rather horrible outside. The swell is 5 meters with the waves coming every 5 -7 seconds. The ocean for the last 4 days has been much more like the Southern Ocean I have experienced before. I think the exceptionally calm conditions we had for most of the mission to date are well behind us now and we’ll have to adjust to the normal conditions of the roaring 40’s and screaming 50’s. Ok now onto the report from Pier van der Merwe on the Australian night (photos to be posted soon). On Saturday night, we celebrated the cooperation between nations that enabled KEOPS2 to come into fruition. It is a multicultural mob onboard and the Aussies only make up a small fraction of the countries represented. However, the ship sails under a French flag and is decidedly French. So, to thank our friends that made this cruise possible, we celebrated with a strong French tradition of aperitifs before dinner, albeit with an Aussie twist. Our fantastic French chef onboard prepared some finger food (note the absence of party pies and sausage rolls and substitute in sausisen and pate!) and we shared some nice Australian “sparkling wine”. You really must not call it “Champagne” (or even worse, “Champers”) when in French company as this name is reserved only for wine produced in the Champagne region of France. It would be like mixing up rugby league and union, its just not on. We were careful with our words and they were delighted to try some of the fine wine that Australia produces and were very thankful. Tom gave a speech (in French, well done Tom!) to share our appreciation for being able to participate in the cruise. Tom also made mention of the fantastic support our French friends gave Andy during the first KEOPS cruise when he became seriously unwell. For Andy, being here, fully recovered, on KEOPS2, represents a full circle and a happy ending. The night progressed, full of laughter and great company and capped off what was a very busy week on the Marion! In the next section Meng Zhou describes the Current Drifter (photos to be posted soon). turned off and so it floats with the currents. A modern drifter, like the one Leanne put into the ocean yesterday, is a sphere. This floats on the surface of the ocean with and has an antenna attached to it that communicates with satellites. It also has a drogue attached to it. A drogue is is a long tube of material with holes in it that hangs down in to the water column, it is the drogue that is pulled by the current which then pulls the drifter sphere with it’s antennae along. A drifter reports its position 8-10 times a day so that we can know where it is and how fast it moves. It is this way that we can see where the currents of the ocean go. We are using around 50 drifters in the KEOPS study region to understand which way the currents are going. It helps us build a picture of them and also where we might want to sample next. Meng uploads the position of our drifter “Eucampia antarctica” (and the other 40 odd out there now) everyday to our ship. I will try to post a picture of the movement of our drifter to show you where it goes over the next 2 weeks. I’m off for some sleep before the next station starting at 18:00 hours (6pm tonight). Today's blog is written by Di Davies from ACE CRC. She talks about the Gel traps and what she has found in them. We remain at the North Polar Front Station until later tonight. I'll have a multicorer station here as one of the last deployments. The water outside is cold, 2 to 4 C, well stirred by wind and waves and easily dissolves carbon dioxide from the atmosphere. Phytoplankton consumes the carbon dioxide by photosynthesis, building new cells and spores in the sunlit surface waters. The phytoplankton becomes the food base for a diverse assemblage of grazing zooplankton and they are in turn consumed. All of this feasting produces, putting it delicately, faecal pellets, dead cells, some grizzly body parts, some clear gooey slime (exopolysaccharides), which sink at different rates into the dark cold waters of the deep, often loosely bound together as flakes of marine snow. Some animals such as copepods produce small faecal pellets with a membrane that keeps them intact. Others such as salps produce dense and fast sinking pellets, the wombats of the sea (if you have ever looked to see what a wombat leaves behind). Minerals too are produced in the surface waters and will also influence the rate at which this waste carbon at the end of the food chain will sink into deep. The whole process is a biological pump, removing carbon dioxide from the surface waters and hence the atmosphere, to the deep where it remains. Examining the particles recovered from traditional sediment traps (carefully designed cylinders) has been confounded because they allow the particles to roll together and so it is not clear if the particles have been produced naturally or by the trap itself. Our Gel traps are tubes that have in the bottom a thick clear liquid, a linear polyacrylamide, which gently slows the sinking particles and holds them in place, embedded in the gel. Deploying a series of gels at different depths allows us to see which types of particles are sinking and how far. To do this, the traps are fastened to a long cable and suspended from a surface buoy that is released from the ship and left to drift for 24 hours. The bright yellow surface buoy is almost impossible to see from further than a mile away, even with binoculars. Satellite communications, radar reflectors and solar lights make it possible for us to find it again and but today we are searching for it in fog, a difficult operation. When we find it, a long pick up line floating on the surface trailing out behind the buoy the line will be caught by a grappling hook fired from a small canon and then using the ship’s hydraulic booms and winches, all of the equipment is reeled back on board. The next step for the gels and their precious load of particles is a survey with a microscope here on the ship and then freezing to preserve them further analysis on land. The collage of photos with the gel, its depth, a low magnification survey and a higher magnification demonstrates that at shallower depths there are numerous krill and copepod faeces. At deeper depths they are not so common but they are still recognizable even though they have begun to fall apart. The tangled aggregates have sunk deepest. Evaluation of particle size and type, the flux of particles and their relationship to other types of sediment traps is done by image analysis with particle analysis software. Something that is clear immediately is that at the first site where the gels in the photo were deployed, there are fast sinking foraminifera shells. A sediment corer, the multicorer, was also deployed at the same site, returned amazingly white sediment to the surface, almost all foraminifera shells. The string of gels we are looking for today was deployed in the phytoplankton bloom east of Kerguelen. We can see the buoy’s reflector on the ship’s radar. Messages with latitude and longitude from the iridium low orbit satellite system are coming in by email and the Gonio is indicating the direction and signal strength of the Argos beacon and the fog is clearing but it is still six miles away in worsening weather. The bridge crew and everyone who can spare some time are helping with binoculars and we are all a little anxious. Footnote: The gels are now safely on board, they were spotted by one of the officers on the bridge, the cannon was fired successful to capture the line and bring the equipment safely on board. Di is now working on getting these samples ready to put under the microscope. Back in transit to the north. Our repeat station E1 is now finished and we are heading back up north above the Antarctic Polar Front to take samples as another comparison station to our bloom location and that of our western reference station called RK. We are currently steaming at 9 knots along a bearing of 84°, the wind has again increased from yesterday. It is now 24knots from the west and thus is pushing the ship along from behind. We are currently at 48°40’S and 72°27’E. The air temperature as you might have guessed is getting warmer as we head back up to the north east of our last station. It is now a sweltering 4.6°C! They will have to turn the heating down inside the ship soon! The sea-surface temperature remains at 3.0°C for the moment. The skies are a pale grey-blue. The swell is 3m and the main waves are around 20 meters apart every 4-5 seconds. As we are in transit most of the day and night, the team headed by Tom Trull and Andy Bowie from ACE CRC are hosting a special pre-dinner drink in the entertainment room. They have bought with them bottles of Tasmanian sparkling wine (Champagne) to share with everyone on board. So it is now officially known to everyone that it is the Australian night tonight. They have also brought along Tasmanian pinot noir that will be placed on each table for dinner for those that would like a glass with their main meal. I think we are all looking forward to tasting these special wines. I know that Tasmanian pinot noir is one of my favourite wines, so I will have a glass with my meal. Today while we are in transit I will be repairing my Phytoplankton net. The metal strap that holds the base of the plastic plankton catcher cup (called a cod end) at the base of the net snapped off on yesterdays haul. So I need to fit a new one today before we arrive at the station tomorrow. I’ll also check the net carefully to make sure there are no holes or tears and repair any I find with a special glue. Veronica is currently working up a database of all the CTD water samples that she has been collecting and preserving so that we have it all organised ready to pack to return to Australia at the end of the mission. Our samples have to pass through Australian quarantine, just like everyone who enters Australia passes through quarantine at the airport or a harbour, and we have to make sure that everything is labelled correctly and with our special AQIS biological sample import permit number that is associated with my samples and the special quarantine laboratory that the samples will be kept and worked on when I return to Macquarie University. Once I have my net repaired I will be back behind the microscope for a while looking at some of the samples Tom Trull and Diana Davies have collected from their floating trap that collected falling oceanic particles for 12 hour periods. It will be interesting to see if there is a difference between the day and night sampling periods. Well that is all for today. Time to repair the phytoplankton net. I’ve just come up to the bridge to write today’s message and am looking out at the sea to gather my thoughts before I start writing. As I look out to the port side of the ship I see something large, shiny and grey jump out of the water and dive back in. I make some noise to alert the others on the bridge and they all see the seal come back up and dive down again. It is playing in the bubbles of the ship’s stabilisers (the propellers around the ship that help it stay in position). Just as fast as I see it, it is gone. So quick, I couldn’t capture it with my camera! I have a photo of a seal that another scientist on board (Manuela Hartmann) captured on her camera when she was taking CTD samples that I will add to the photos page. We still have a panoply of sea birds around us, they remain very inquisitive of all the equipment deployed off the rear deck, and I guess are still wondering when the fish will appear when we bring in that equipment. I will also put up another photo of the whale spray and whale hump that Manuela also captured a week or so ago. She has been lucky to see so much outside. I’ve been mostly looking down a microscope inside the ship instead. I can’t complain as I get to see a lot of other organisms that no-one else does. Today we are still on the same E1 station (48°42’S, 71°58’E) as we run through all the chemical, physical and biological sampling deployments. Veronica collected seawater from two CTD water rosettes through the middle of the night and I will have my phytoplankton net haul around lunch-time today, followed by an afternoon of microscopy. The wind has picked back up today (18 knots from the north) so our Southern Ocean “lake” is now a little bit more like the Southern Ocean again. The winds from the north are bringing warmer air to us as well. It is now a toasty 3°C outside and the sea surface waters are also slightly warmer at 3°C. I have looked on the clinometer on the bridge and we are now rolling 3° to port (left) and 5° to starboard (right). It isn’t really very much, but after flat seas for more than 2 weeks now it makes you feel that we are moving a lot. We now have around 3 weeks of sampling left to go before we head back to Reunion Island. A lot of us are now well into our groove of sampling, some are now looking forward to the end. It is very tiring to work all hours of the day and no days off or weekends, I guess the best thing is that we are not cooking and cleaning, as there is the support of the crew to do a lot of this. Regardless you can see the fatigue on everyone’s faces now yet we are all driven to obtain as much out of the mission as possible since this is our only opportunity to be here taking samples. We will all have a lot of work for the next 1-2 years to analyse and write up on what we have found. The big job comes a year later when we all get together to work out how everyone’s results fit together and helps us to understand how the physics, chemistry and biology work together to produce bloom conditions in this special region of the Southern ocean year after year, when in larger sectors of the Southern Ocean it does not. Atmospheric pressure of 255 bars. Last night we finished the E-W transect around midnight. We did 9 stations in 3 days and I didn’t get very much sleep over those days as most of the time was spent sampling and then looking down the microscope to detail each phytoplankton community. This is also why there was no blog report yesterday. I managed to get 8 hours sleep this morning after getting to bed at 2am when my last sample observation was completed. I feel (and look) a lot better than yesterday. I have been paying a lot of attention to the diatoms as we went east along this transect. We started near the coast of Kerguelen where I could see a coastal community of diatoms, crossed the continental shelf of Kerguelen into the deeper oceanic waters where the major bloom is really developing now, and then finally crossed further to the east with our last two stations where we entered into another community outside of the main bloom we are studying. For me the most interesting of all the diatoms continues to be Eucampia antarctica. I can see many differences in this species as I cross into the different regions of this transect. I will put together all my findings on this species and eventually write a scientific paper on what I have been able to observe and how this compares to the oceanography and the chemical composition of the ocean in this region. The other special thing that happened last night was a CTD water sampling deployment that went down to 2800m (at latitude and longitde: 48° 28.00 ' S – 75° 00.00 ' E). It was on this CTD deployment that I sent down the cups of Mr T’s grade 4 class (Killara Primary School). The cups had been placed in a plastic onion bag from the galley that I stitched together. Each cup has a small amount of paper towelling in it to keep the cups separated from one another. The onion bag with the cups were then placed into another string net that one of the crew (the Bosun Gé Gé) had put together that we could then attach to the CTD (see photos of me with the bag on the CTD). The CTD was deployed at around 7pm and took around 2 ½ hours to go down and come back up again with all of the different water samples in its bottles. About 30 minutes before the bottles were due up I couldn’t contain my excitement to see the CTD back on the ship, hoping that the bag was still intact with all those cups still inside. When it finally came up out of the water after taking the last water sample at 10m below the surface, I couldn’t see the bag at first as was on the other side of the rosette. I had a short second of disappointment, which evaporated very quickly as the CTD slowly spun around to reveal the bag still attached and intact. Woohoo! The cups were now 1/3 the size they had been originally. The cups had been down to the bottom of the ocean 2800m below the sea-surface and had experienced ~255 bars of pressure. It is hard to imagine that amount of pressure squeezing you on all sides - I guess one way to think about being squashed by a 2.8 km high bucket of water over your head. That is a lot of water and it would be very, very heavy, so you’d be feeling pretty well squashed. Of course the cups were experiencing this pressure from all sides and so any gases in the polystyrene cups were squashed out and the then the matter of the cups were compressed as much as possible. When the cups come back to the surface they can’t return to their original size as gas that was in them has gone and can no be put back in. The end result is your miniature cups. When I return in December I will present them to you when I speak to the class. I have put some photos up of the cups going down, coming back up and also back up on the bridge. You will see the Captain is happy to have his to give to his son Hugo. Ok well, I guess I better provide you with some details about where we are now. We are now back at our repeat bloom station E1 for the next 48 hours. It remains chilly outside with the air temperature at 1.5°C and the winde at 16 knots from the northwest. The sea-surface temperature is slightly warmer today at 3.0°C. The swell is around 1m and the wave period around every 7 secs. We did have clear skies while steaming into the station but are now sitting in a light fog, that will probably burn off before too long. We are currently steaming at 13 knots along our E-W transect and are between the station 4 and our return to the middle of the bloom , the station called E1. Our latitude is 48° 33’S and longitude is 71°55’E. The wind is 13 knots as well from the east. The sea water is a little warmer here at 2.8°C, but outside it is 2.2°C. Yesterday, we a very full day with there stations completed in approximately 30 hours. I spent mostof the day behind the microscope analysing the phytoplankton captured in at each station with the phytoplankton net. The first two stations nearest to Kerguelen were completely different phytoplankton communities. I guess this would be best called a Coastal community. This community was dominated by a group of diatoms known as Thalassiosira (pronounced Thal -las- eeo- sira). They look fabulous under the microscope because they resemble necklaces of large beads. I will send a photo of how these look. The last station we visited last night had a community that returned us back to the oceanic community that I have been observing the last few weeks. However, there were some diatoms missing from this oceanic community, which I thought was interesting given the others present. I will have to look at the data the chemists are gathering to see if there is an explication for their absence. I managed to get to the Halloween party although a lot later than most of the people on board because I had to finish my samples first. I went as a zombie (yes, a photo in the next day or two I promise). There were lots of great costumes (witches, aliens, a mummy, more zombies, and other strange things from the sea) and a good night was had by all. Unfortunately I had to leave early as well because I had a new station early this morning. I have just sampled it and will work on that before our next station in the next hour. I heard that some Australian aliens and mummies stayed up dancing until 5am this morning!! Lucky for them they are not doing any sampling today and can get some sleep. We should have another guest blogger from the Australian Team write the next instalment while I am busy sampling for the next few days. Today's Guest Blogger is Veronica Peralta. Today, Monday, the 31st of October we arrived at the starting point of the West to East transect, TEW1 at around 7am. This starting point was close to Kerguelen Island, about 10 nautical miles, and so we awoke to the North East view of the Island - many steep brown coloured mountains, some with patches of snow on their peaks and some peaks even hidden by the low lying clouds. We are at Latitude, 48 Degrees 55 minutes South and Longitude 70 Degrees 33 minutes East. Celsius. The wind is blowing at 12 knots in a NNE direction. With the ship travelling at 14 knots we will be reaching TEW3 at around 6pm, local time. While the French don't generally celebrate Halloween, there is always an exception to have a party on board the ship, especially when it's a dress-up party. So today is Halloween Day on the Marion Dufresne. With no shops around for easy costume supplies, costume making becomes all about recycling and thinking outside the square. I have already seen wax paper being used to make a witches hat, decorated with stars cut from coloured celophane, talcum powder used to make white faces and hair, garbage bags to make wings for a bat costume, aluminium foil to make an alien outfit and lots more innovative ideas I'm sure that will be seen tonight. In the middle of costume making samples are busily being collected and analysed as the ship will be moving quickly through the 3 stations we will be stopping at today. As always the lunch was in abundance - the first plate, entree was a salad of white and red cabbage with apples, the main was a chicken schnitzel, probably the biggest schnitzel I have ever seen, at least 20cm long, served with lots of pasta, followed by a variety of French cheeses and dessert was mango ice-cream, with a pineapple, ginger and guava sorbet topped with whipped cream. Very yummy and very filling! Since we are half way through the mission the variety of fresh fruit and vegetables is becoming less and less, though with such big servings it is hardly noticed. Today is the last day on our Eddy station, we’ve all been working around the clock on sampling this region. Our current position is 48°30’S and 72°10’E. The wind is 8 knots from the north east. The sea surface temperature is 2.8°C and the outside air temperature is 1.7°C. There is barely a perceivable swell of <1m. So the peculiarly calm seas persist for us, and we are all beginning to wonder when the big storm will arrive. When it does I think we will all be stunned by the change. Yesterday it was even sunny and we were all out getting some sunshine on our faces between the sampling. Manu played his guitar and Di her concertina, so it made things very pleasant while waiting for my Phytoplankton net to go in the water and others for their CTD after my net deployment. Some of the French scientists were considering that the conditions were like being out on the Mediterranean Sea it was so nice. I should point out that the air temperature was still a chilly 1.6°C but the wind was only 2 knots so I guess we all thought it was like summer in the Southern Ocean. While we have been on this station we have had a lot of petrels hanging around the boat. They think that we are a fishing trawler and thus are hoping for a free feed. They have come to the wrong ship for that. We also have had some seals lounging around, some curious to see what the CTD is. Unfortunately we haven’t seen any whales, which is a shame given that we have such calm seas that would make seeing them optimal. When someone does see a seal or penguin the word passes quickly around the ship and if people aren’t working they try to get outside with a jacket on to have a look. Often though the show is over before you get there. I keep missing the seals. I hope to catch a look at them one day. Today being Sunday means we have pain chocolate for breakfast and that we have the special lunch of the week. Today we have seared duck and vegetables, followed by a selection of fine French cheeses and then a decadent dessert. I’m told it is a “Charlotte”. When I worked in my lab this morning I could smell from the corridors the duck being cooked (my lab is not far from the galley). It is funny to try and guess what the food being cooked is, especially when it smells so delicious. Well for the moment that is all. I need to get out of my work clothes and get myself cleaned up for lunch. We finished up at the reference station yesterday in the mid afternoon. We successfully picked up Tom’s gel traps and they were prepared for analysis under the dissection microscope. Tom, Di and Manu had a quick look at one of the traps last night and could see faecal pellets and large radiolarians under very low magnification. They will work on these today at highr magnification to see what other smaller particles were trapped. I hope to have some photos of the parcticles to show you by Monday. On leaving the reference station we also went past the region where Tom’s other floating instrument could have possibly drifted but unfortunately even with excellent visibility and calm seas we did not find his other buoy. It was decided to abandon the search for it and continue on to our next station back on the plateau. There is always the hope that it will turn up eventually on a beach somewhere, maybe in Tasmania or New Zealand as the currents could take it that far. 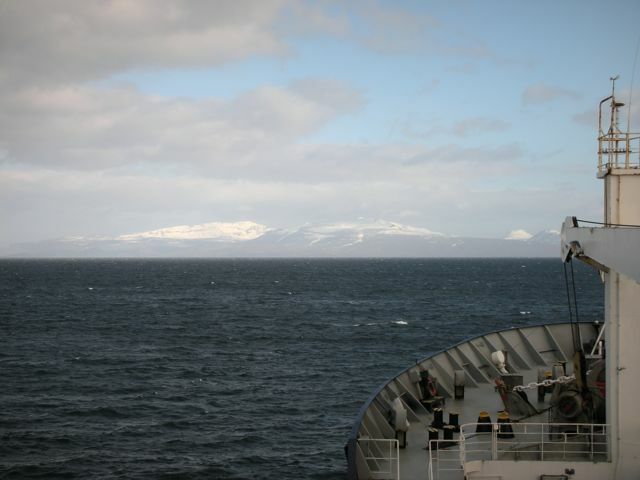 This morning around 9am we sailed past the southeast corner of Kerguelen Island. We could see it on the horizon with snow capped peaks. We are around 4 hours away from arriving on our new station. Again we have another big scientific meeting just after lunch to talk about what has been found so far and what the plans are for the next few stations. I have to speak a little about the phytoplankton that I have been observing along the north-south transect. This will be merged with the physical oceanographers information on the development of our spring phytoplankton bloom region of interest in an eddy of water east of Kerguelen. This information combined helps decide where we continue sampling to follow the bloom development. I am excited to return to see what is happening with some of the diatoms, especially Eucampia antarctica, Corethron pennatum and Fragilariopsis kerguelensis (and many others). So let me go and check on one of the ship’s computers in the bridge as to our position while in transit now. First of all we are at 49°18’S and 71°17’E. We are travelling at 13 knots along a bearing of 56°. The wind has picked up again slightly. It is currently 22 knots from the south-southeast. The outside air temperature is 1.2°C and the sea surface temperature is 2.2°C. The swell is still around 1 m and the wave period is really hard to tell as it just looks choppy to me. Let’s see what the Lieutenant Flavian thinks? Flavian thinks the smaller waves are around 2 seconds apart but that essentially it is choppy and any motion we have is really generated by wind created waves. In other words we still have very good seas. We are all starting to wonder when our luck will change and the big seas that are normally out here will arrive. Well some disappointing news this morning. Mr T’s class’s cup didn’t make it to the bottom of the ocean last night when we sent the sediment corer down. We had a technical problem in attaching the bag with the cups and as time was running out I decided not to attach them for fear of losing them altogether. So we will have to wait until the next coring station until I can try again. We will try to make the attachments more secure so that I am certain that we will get them back. The next multicoring station will be in a few days, so I hope you don’t mind waiting a few days more? So although this is sad news for the class the mulitcorer was successfully deployed to 2500m and came back with it’s eight tubes with both water and sediment from the bottom of the ocean. This time the sediment was coloured creamy white and looked more granule-like (see photos). It is like this because the main components of this sediment are the skeletons of zooplankton called foraminifera. Foraminifera skeletons are made of calcium carbonate (just like your bones) and so give the sediment his characteristic colour. I will put some of this sediment under the microscope today and take a photo to show you. The sediment sample that we took on the Kerguelen shelf in comparison was far more organic and composed of the silica-based skeletons of diatoms. The texture of this organic sediment doesn’t look or feel the same. I also took a Phytoplankton net yesterday afternoon. It is still full of diatoms although the sample is not as prolific as those we see on the Kerguelen Plateau. What was more noticeable was the increase in foraminifera in my samples (See photo). This makes sense when you consider we found so many in the sediment sample. (see the web site page on Plankton if you’d like to know more about this) to where the carbon is effectively trapped (rather than dissolved into the ocean layers or respired back to the surface) and dispatched to the depths of the ocean or to the seafloor. When the tubes are recovered later today, Di will then take the gel trap off the tube and look at what sort of particles are the main type falling to the bottom of the ocean. Given that there are a lot of foraminifera making up the sea floor surface and that I saw a lot of them in my phytoplankton net my guess is that they will find foraminifera in their gel traps too! Before I sign off I should give you some more details on today’s conditions. We remain at the same latitude and longitude. The sky is still carpeted in light grey clouds and we still have a surreal calm sea. The wind has picked up slightly. It is 16 knots from the south. The outside air temperature has dropped to 0.4°C and the sea surface temperature is 2.1°C. More from our next station tomorrow. I woke this morning to a weird feeling. The boat is hardly moving. I look outside my port-hole window and notice that the sea is very clam, there are no waves the swell is slow and gentle and hardly at half a metres. These conditions are not what one expects in the Southern Ocean at all. I have attached a photo to show you what it is like. We are currently at the latitude of 50°22’S and the longitude of 66°42’E. There is no bearing direction or ship speed as we are on station. The wind outside is 2 knots- a gentle breeze I guess. The air temperature remains cold though at 2.1°C while the sea surface temperature is only just a little warmer than the air temperature at 2.4°C. The only thing missing is the sun in the sky to make it really really feel like we are somewhere else but the Southern Ocean. It is cloudy and essentially light grey outside. Last night I spend 1.5 hours looking out for the missing instrumented buoy, but to no avail. No-one has been able to see the red flashing light. By midnight the hunt for it was given up as we approached the reference station. Two CTD water rosettes were taken in the small hours of the morning. Veronica was up doing this sampling. I was lucky enough to have a full nights sleep. Today there are around 10 activities planned. Three of these I will be involved in, CTD sampling, the Phytoplankton Net and the Multicorer sampling of the seafloor. I need to check with the echosounder in the scientific room the depth of the sea floor exactly but at this stage looking at the map on the bridge the sea floor is around 2500m below us. The cups are ready to be sent down (photo at the bridge is posted). I will send some photos of the event to you in the next few days. So you might be wondering why we have a reference station where we are now? This station was chosen west of our study area as it the source region of the waters that flow over the Kerguelen Plateau into the region where the Spring bloom occurs. This latter region is of course where we have been sampling last week. We return to the Reference station four times over our time at sea so that we can see what the background conditions, both chemically and biologically, are like. It enables us to make a comparison between the region that is removed from our fertilised Kerguelen Plateau but essentially has the same water properties. It is also why all the different types of measurements and samples are made here and why we are on station for virtually 2 days. the bottom of the ocean. More on that when it happens in the next 30 hours. Dr Andy Bowie from the Antarctic Climate and Ecosystem Cooperative Research Centre (ACE CRC) has kindly put together some information for you all on his activities on sampling for trace metals in the ocean. There are also some photos posted on this. So before I sign off and start looking for the buoy from the Bridge I’ll provide you with our current position and environmental conditions. The swell is around 1 m.
This blog post is all about how we sample for trace metals such as iron, copper, zinc, cadmium, and some more exotic ones such as neodymium, in the ocean. These trace metals limit the growth of the single-celled algae that live in the waters of the Southern Ocean, as have extremely low concentrations in seawater, in the range of pico grams (1 x 10-12g per gram of seawater); which is like trying to find a pinhead in an Olympic size swimming pool! Since we are on a ship and metal (particularly rusty metal) is all around us, we have to take extra precautions to prevent contamination of the seawater samples. This is achieved using a trace metal rosette (TMR) and the trace metal clean container. How does the TMR differ from the conventional CTD rosette? The TMR is designed to be as metal-free as possible, and where metal has been used, the materials are of the highest quality such as titanium. There are twelve 10 litre sampling bottles called Niskins on the TMR that are modified from those used on the conventional CTD, so as to prevent metal coming in contact with the seawater during sampling. This includes features such as a Teflon coating inside of the Niskin and taps that are also made ofTeflon, a high quality non-stick plastic. The springs used to shut the top and bottom lids of the Niskin are coated in plastic and located on the outside of the bottle; in comparison to the conventional CTD, where the metal springs run through the inside. The TMR sits on the aft deck of the ship and is usually protected by a thick plastic cover, which further helps to reduce exposure of the trace metal clean Niskin bottles to any metal contaminants on deck or airborne dust from the ship's exhaust. How is the TMR deployed? The Niskin bottles of the TMR are kept inside the trace metal clean container where the seawater is sampled. At the last moment before deployment, the Niskin bottles are transferred from the clean container and set up on the TMR. The TMR is deployed from the back of the ship using a non-metallic Kevlar rope and a specialised trace metal friendly block suspended on the A-frame, which has a plastic drum which the Dynex rope passes through. The TMR does not have the capacity to communicate with the ship during deployment. Instead it works off an autonomous system that is pre-programmed before deployment. There is a pressure sensor attached to the TMR that triggers each Niskin bottle at pre-determined depths as the TMR is winched back to the surface, before recovery onto the ship's aft deck. What is the sampling procedure for trace elements in seawater? Once the TMR is secured, the taps on the full Niskin bottles are immediately covered with plastic bags and the bottles then carried carefully back into the clean container and racked, prior to filtering for the analysis of various trace elements and their isotopes. The clean container laboratory has been specially converted into a trace metal clean environment, with afiltered air system in addition to HEPA filters above the racked Niskin bottles and virtually no exposed metal inside. The scientists working in the clean container wear plastic suits, Crocs and vinyl gloves to further protect the samples from any contamination from the scientists handling the bottles and sampling equipment. The sample bottles used to collect the seawater for trace metal analyses are thoroughly acid washed back in the laboratory on land prior to the cruise, and transported to sea filled with dilute acid. This dilute acid is poured out inside the clean container, then the bottles are rinsed three times with the filtered seawater collected from various depths in the water column, after which the sample bottle can be filled. This all has to be carried out very carefully to ensure that seawater samples remain uncontaminated. It takes approximately one to two hours to filter and collect samples at most stations. After the samples have been collected, they are acidified on board to ensure that the metals stay in solution. Some trace metals such as iron are analysed at sea, whilst others will be analysed in the home laboratory after the cruise. It is only in the last few years that this technology has been developed and enable scientists to answer important climate change questions in the Southern Ocean. Kind regards From Andy Bowie. We are now on our way back to our first reference station. This 2 day transit will take us back past the southeast of Kerguelen Island and then further southwest to the oceanic reference station in a region that is not affected by the spring bloom conditions east of Kerguelen where we have been the last few days. We will have a big scientific meeting today at 2pm to go through information we have collected thus far, the planning for many deployments at the reference station and also the future station plans from then on. When we finished the last station TNS-1 last night around 8pm the ship turned around and headed south. This meant that the ship started to rock and roll. I was at the second dinner sitting having completed my phytoplankton net half and hour earlier, when the ship turned. This meant that we were all holding on to the table, our glasses and plates as the first big rolls of the ship started. Some people started to slide with their chairs across the floor from one table to the next. The crew were running about securing chairs and other items in the kitchen servery. The scientists were all sitting down hanging on to their tables. Thankfully nothing was dropped on the floor, except the bread and cutting board in from the servery area. Once things calmed down a few minutes later you should have seen the scientists getting up and running around. We don’t run to our rooms we run to the labs to see what damage there might be. There were certainly a lot of chairs on the ground, and plastic boxes, papers and even books dispersed across the floor in some labs and the general scientific working area. In my lab there were just chairs strewn on the floor all of my samples were safely secured and all the equipments and computers were still attached where they should be. I don’t think anyone had any problems in the end, which is always good news. After the activities of the last few days and also of the rock and rolling of the ship when we turned around most scientific staff went to bed very early to catch up on some sleep, including myself. Most of us got up extra late as well this morning. I missed breakfast altogether and am now waiting for the second lunch sitting as this is the one I am assigned to. The smells from the galley though are making me very hungry so I though I should write this blog up in the bridge now to keep myself distracted. We have a cloudy day today and still relatively calm seas. The swell is still around 1 m. We are currently at 48° 53’S and 71°51’E heading along a SW bearing of 218°. We are doing 13 knots. The wind is currently 22 knots from the northwest. The outside air temperature is 2.7°C and the sea surface temperature is 2.4°C. The Lieutenant, Flavian, tells me that although we will pass around 30 miles to the east of Kerguelen today we might only just see it at the horizon if the skies are clear. Tonight though we will pass very close to three small islands south of Kerguelen called the Roches des Salamanca (Salamanca rocks), the Iles de Boynes (the islands of Boynes) and the Ilot de Solitaire (Solitary island). Essentially, these are very tiny outcrops of rock that we’ll probably have difficulty seeing in the dark since they are not inhabited. The ship’s officer on duty tonight will however, be looking out for them on the ships radar so that we don’t get too close. We should arrive at the reference station around lunchtime tomorrow. Today, aside from the meeting I will be working with Veronica on files related to the samples, making sure that all is in order and up to date, and properly labelled. as such a day o catch up and prepare for the next station and beyond. The last three days have been non-stop sampling deployments and then quick transits to the next sampling station. We are now almost at the end of this transect. Currently we are in transit to the second last station and it is a beautiful day outside. Here’s the next information for plotting our position and the environmental conditions. It is really quite nice today compared with the freezing grey days we’ve had recently. We should finish the last station tonight. As I mentioned in my last message we are doing the same sampling equipment deployments at each station and so the crew and scientific staff are well versed in what they are doing each time we stop on station. As you can imagine the deployment of the zooplankton capturing bongo nets now takes half the time it did when we first started on the transect. Last night there was some fun in the entertainment room while we were in transit from station 4 to station 3. One of the junior officers organised a “guess that tune and artist” competition. It was a lot of fun as we have so many nationalities on board and the junior officer had gone to a lot of trouble of making sure there we songs from everywhere so everyone could participate. As the game was played people were yelling out names, singing along and even getting up and dancing. There were extra points sometimes if you could do a good impersonation of the singer (e.g. Michael Jackson, or some sort of air guitar hero). It was really a lot of fun for everyone. I have been doing a lot of diatom observations from some of the bongo nets and also once from a phytoplankton sample that I was able to get from transit Station 6. I hope to get another one at the last, most northern station later today. Veronica has been very busy taking all of the CTD water samples, although as she is very tired now I’ve told her I’ll take the next sample and she can go and get some well earned sleep. One of the diatoms I am interested in is called Eucampia antarctica. It is a diatom that is found in the Southern Ocean and has two varieties. A single cell looks like a capital H. One variety (Eucampia antarctica variety recta) lives closer to Antarctica in very cold waters and makes long ribbon like chains. The other variety (Eucampia antractica variety antarctica) lives in the “warmer” northern part of the Southern Ocean and makes coiling, cork-screw chains. It makes this coiling chain because one side of the H shaped cell is slightly longer than the other, mean it is asymmetrical in shape. The polar variety recta is symmetrical in shape and so make straight ribbon-like chains. The warmer variety antarctica is common in the waters around Subantarctic Islands such as Kerguelen and Crozet, so it is one that I am interested in knowing more about. At the moment in some of the stations I have been to I can see that this diatom is still in its winter resting form, but in other stations I can see that some of the winter chains have started growing their spring form cells. I will put some photos up of this. I hope to see in the near future how the early spring forms of this diatom then change into their normal summer coiling chains as the spring bloom develops. This will help understand the changes between this species and the chemistry of the water that others are studying out here. I don’t get much in Australian News out here but was happy to hear that the Wallabies won their match against Wales. This afternoon there will be quite a few people up in the Bridge listening to the French radio to hear the Grand Final between France and New Zealand. We have finished sampling the first of three times at station A3. I think we finished up at around 3am there this morning. I worked on describing the different types of species caught in the phytoplankton net that I had taken in the late afternoon. Unfortunately the net was a little torn when it came back up and I will need to repair that this afternoon. The diatoms in this sample are very different to those that we saw near Crozet. Here they are much larger in size and completely different in terms of the species found. This time it was dominated by what we call centric diatoms, diatoms that are round in shape. There were many different types I think I observed around 20 different species. We also took a multicorer sample late yesterday. The multicorer takes multiple samples, eight to be precise, of the seafloor and water interface. That is the tube that penetrates the sea floor captures approximated half a tube worth of the sea floor sediment and the other half is the water that overlies the sediment at the bottom of the ocean. Like the CTD there is a trigger function that closes both ends of the tube to trap this sample so that we can bring it back to the ship. Last nights sample didn’t go very deep only to around 500m as the Kerguelen Plateau is shallow. Later we will sample the sea-floor at round 1000m and 3000m. There should be a movie posted about the zooplankton and multicorer sampling on the movie page of my website today/tomorrow/early next week that shows how this works. I will be sampling the sediments from these cores later today. I will take a look at one of the samples from the surface, but the rest will be sent home to be worked on in my lab by myself and University students. As of today we are now sampling along a N-S transect that should take us across the region where we expect the phytoplankton bloom to be developing in an oceanographic eddy (an eddy is a mass of water that is turning in a spiral and the conditions inside this eddy are generally different to that in the water outside). This transect will have up to 10 stations along the way. We are only doing a few equipment deployments along this transect: the bongo nets, a CTD water rosette down to 450m depth and another water sampling instrument to look at particle sizes in the water column. So we should only be 6-8 hours at each station before steaming on to the next one. I will only be taking water samples from the CTD water rosette and also from some underway stations. We have finished the first of these stations N-S stations are already heading to the next one. Our current position between these two stations is latitude 50°8’E and longitude 72°9’E. As we were leaving the first station a fog rolled in over us but it isn’t too dense. Hopefully the sun will burn through it soon. We are now doing 13 knots on a 93° bearing. Can you guess how cold the air is outside right now? 2°C you say, maybe 1°C? No, right now it is a chilly 0.4°C. Do you think the water of the ocean is colder or warmer? Same perhaps? Today it is slightly warmer than the air temperature 1.8°C. I guess the difference in temperature between the two might explain our fog! The wind is 20 knots today coming from the north. I should also mention that the answers to the questions from Mr T’s grade 4 class at Killara Primary School should be up on their special page today. They are great questions, keep them coming. Today's blog is written by Veronica Perlata. She recounts her first day water sampling. We are at Latitude: 50°38’S and Longitude: 72°05’E. Today, the 20th of October, was scheduled to be a busy one with plenty different sampling procedure at this specific location for sea water sampling. The first sampling that I am involved in starts at 4:30am. Like with a lot of fieldwork, though, the plan shifted by an hour and the sampling finished instead at 6:30am. So some people went back to bed, slept at their desks or stayed up and enjoyed a freshly baked croissant, that are on the breakfast menu every Thursday. I was one of them and can confirm that it was the best croissant I've had, still warm from the oven! When the time comes to collect water the cold weather gear is put on - a freezer suit that feels and looks like a padded jumpsuit, warm hat, scarf, gloves and boots, and a big jacket (see photo). Even with the temperature as low as 7 degrees Celsius outside, with the water temperature as low as 1.83 degrees Celsius the cold is hardly noticed with the cold weather gear on. The water samples are then taken to the labs on the ship, which would normally be bedrooms, and testing begins. Although the schedule was set back by 4 hours, many people were able to collect their particular samples one of which contained live krill - about 4mm long that looks just like a prawn. In between sampling people exercise, using the gym on board, nap, or have a warm drink with chocolate, shared by those with a personal stash (a must have) as well as work of course. So off to prepare for the next round of sampling. Rough Seas and Kerguelen Island reprieve. Unfortunately my Tuesday message got lost in the network and was not retrievable. Essentially we did get to our First repeat sampling station (known as A3) but after one CTD deployment that failed and with rising waves and the weather getting worse the sampling at Station A3 was cancelled (as snow started to fall as well) and we steamed off to Kerguelen Island. Being within the bay of Kerguelen Island we would be protected from the storm and also we would be able to drop off the 11 scientists that would be staying on the island for the next year. It would take us around 10 hours to arrive. This morning we steamed into a glorious view of snow capped mountains within the bay of Morbihan at around 7am. The tallest peak we can see is Mt Crozier at 978m (see photo). The highest mountain on Kerguelen is the Grand Ross at 1849m but this is on a southern part of the island far from where we are in the bay. Everyone was up at the bridge taking video and photos. 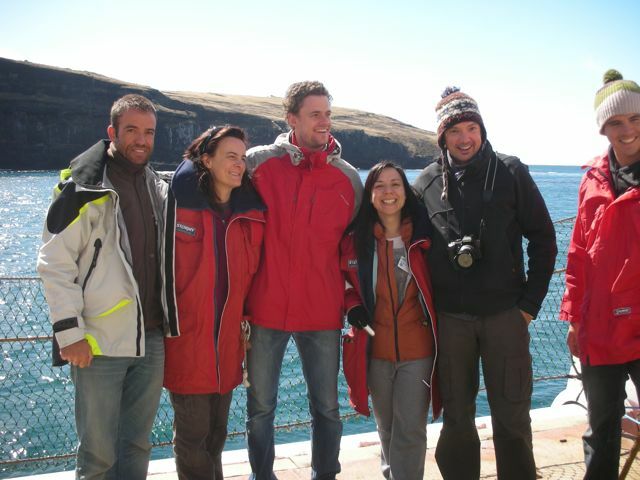 The Kerguelen scientists were picked up by the island barge called the L’Aventure. We all waved good-bye as she headed back to the shore with the new members of that scientific community. The bad news for us scientists onboard for the KEOPS2 programme was that we’d be staying on board. Only those that had to get off would be going. So we have all been quite sad for the rest of the morning and over lunch. As you can imagine it is a highlight for us to get onto the island and to see the wildlife. We will have to wait now until the end of the mission before that opportunity is made available to us again. We are all keeping our fingers crossed that we will still have a chance to get ashore for a short time. On the way into Kerguelen this morning I was lucky enough to see white and black painted dolphin swimming along the ship trying to keep up. I was not quick enough to take a photo though before it had disappeared in another direction. So let me see if I can provide you with some points to plot for where we have been these last two days. The maximum air temperature yesterday was 2.6 °C and the minimum was 1°C. Right now we are at Latitude 50°6’S 71°13’E doing 12 knots with a bearing of 137°. The wind outside is 27 knots from the west. The air temperature is 2.3°C and the sea surface temperature is 2.1°C. In other words it is cold here and even on the ship I feel cold when I don’t get up and move around often. The wave swell is now 7.5 m high and the periodicity around 30 meters between each wave. We are certainly rolling around and I have heard things falling over when we have a series of big waves pass by. Most of the scientists are in their cabins, reading or trying to sleep now as we all know that we have to start working again as soon as we arrive on station. We are likely to arrive around dinner time . I can see on the station plan that I will be sampling the CTD at around 4am in the morning and then will deploy my phytoplankton net at 6.40am. I’m pretty sure that I will be going to bed after this sampling as I have another CTD to sample at 2pm followed by a short sediment core at 4pm. It will be a busy day not just for me but for everyone. 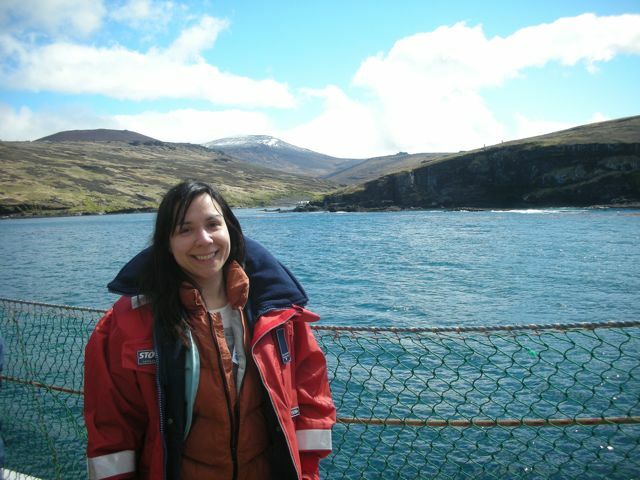 Diana Davies, one of the Australian’s from the Antarctic Climate and Ecosystem cooperative research centre (ACE CRC) in Hobart has kindly written up something about her impressions of the food and especially of the cheese on board. This very fine vessel has a tradition of formal meals with white tablecloths and cloth napkins. We all change out of our work clothes and polish ourselves up before lunch and dinner. The table attendants, dressed in their best white shirts and black trousers, serve our meals with pride and we enjoy a surprising variety of French cuisine. There is always an entree, then a main course with meat and a little wine and then the cheese board followed by fruit or at lunch and especially Sundays, a spectacular dessert. There are a good number of us on board and we are at sea for two months which means that in provisioning the ship, large quantities of fresh chilled, frozen and preserved food have to be stored to feed us all. The spectacular cheese board is presented to us individually at each meal by the Maitre'd Jean-Charles who carves off a little emmenthal or chevre or maybe a Blue veined cheese, perhaps a Camembert, even one speciality from Reunion called the Tacamaca and so many more to choose from. He then carefully takes the slice of selected cheese and with considerable aplomb, holding the slice between two knives held in one hand he places it on your plate, almost all the time. We have a knife and a fork to eat the cheese, a traditional way, but we Australians take a piece of baguette to eat with it. So can you guess how much cheese is on board for us to eat? French cheeses are unpasteurized ripen quickly and to keep them fabulously delicious and preserve them by other than chilling, a quantity is kept frozen. So how much did you guess? We are told by Jean-Charles that there is two hundred kilos for us to eat through!! OISO CTD sampling and Phytoplankton net tests. Yesterday a lot of sampling took place at the OISO station. First the CTD down to 1000 m then the test of all the different nets off the rear deck. 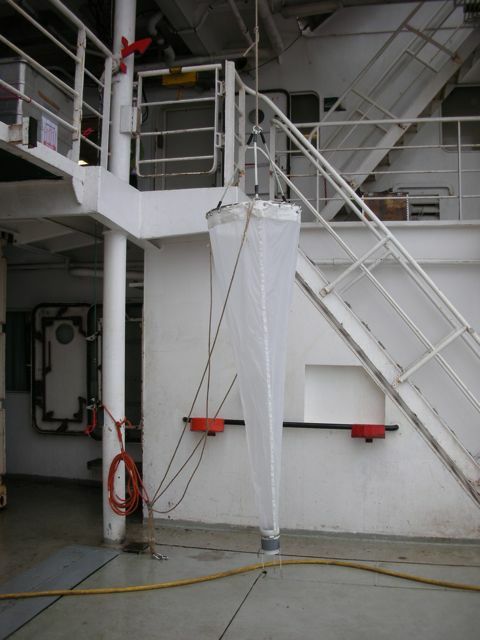 The Zooplankton net was deployed first down to 200m. It is called a Bongo net as it looks like two bongo drums at the top. Then my phytoplankton net was deployed after this down to 100m, after my net then the 5m long Multinet was deployed to 200m. I will talk more about each of these nets and what we collect from each of these in the next few weeks. It is good we did a test as we could see if there were any problems with the deployment of the equipment and also so the crew know what we’d like to do when the net comes back on board. I spent the rest of the day looking down the inverted microscope at the phytoplankton that I had collected. My observations are made at 40 times magnification. The phytoplankton was completely dominated by a diatom called Chaetoceros (pronounced Kay-toe-cer-os). This diatom is quite small and lives in chained colonies that look like fringed ribbons. There should be photo of one of these chains on the photos page if you want to see what this looks like. There was also a large variety of zooplankton in the sample. Veronica is busy getting ready to learn how to take water samples from the CTD. On the 19th of October we have 3 different CTD’s, a phytoplankton net and the multicorer to sample so we will both be very busy. There are a lot of sample bottles to label. The swell is around 1 m (It looks mostly like yesterday -with an agitated surface and no real wave pattern from any direction). The sky remains is cloudy and grey and it looks like we’ll have light rain for most of the day. Today is also the last chance we have to buy stamps and get mail ready to send from Kerguelen when we arrive in a few days. We will have the opportunity to spend the day on the island and take a guided by the scientists on this island so that we can visit the region where penguins and elephant seals are currently being born. Sunday = Pain Chocolat (Chocolate croissants). We are reaching the end of our first week at sea. Being a Sunday this means there is freshly made chocolate croissants on the breakfast table this morning. It also means that everyone makes an effort to get there a little earlier before they all disappear. No one wants to miss out. We are back into transit mode to the next OISO carbon dioxide station at present. We should arrive around lunchtime. I’ve taken 3 underway station samples over night and this morning with only 1 more to take at 9.15 this morning. Most labs on board are now operating or are ready to start the serious business of sampling once we have been to Kergeulen, so with everyone in a more relaxed mode a lot gathered in the entertainment area and danced until late last night. As such this is a great way for both crew and scientists to mingle. It was a fun night, although I still had to pop out to take samples in between a few dances. For those plotting our journey and the changes in the ocean conditions here are today’s location and environment data. The swell is around 1 m (although to me it looks mostly slightly agitated with no real wave pattern from any direction). The sky is cloudy and grey. I can see a few dim patches of light on the surface of the ocean but essentially everything looks a bit grey, cold and uninviting outside. It is now time to head down and take the last underway sample as we cross this Crozet bloom patch. A Busy night sampling and arrival at Crozet Islands. The last 24 hours have been very busy on board. Underway sampling (more on this below) happened through the night as did another CTD deployment for the carbon dioxide group. This CTD was also sampled by many other groups, including the biology group that I am a part of. So I stayed up all night taking samples (two underway at midnight, another at 2 am and then the CTD from 4.30am until 6.30am). 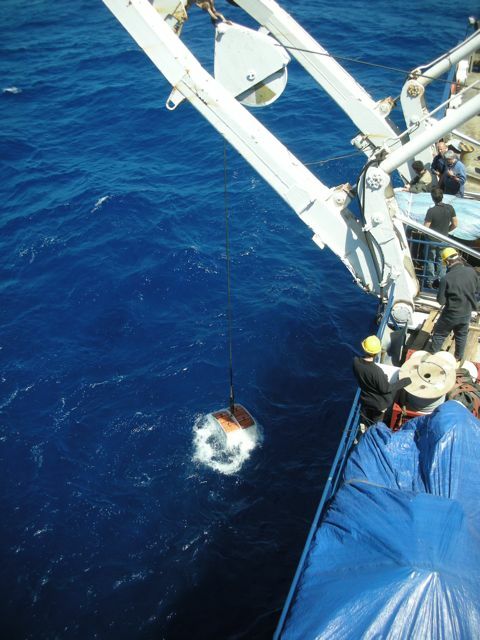 This CTD took water samples from the surface down to 1000m depth. So I have been sleeping this morning between breakfast and lunch as we arrived at Crozet. After the CTD we headed directly to Crozet (Ile de Possession). We have been here for the last five hours. Opposite us we can see the Ile de l’est (East Island). It is a truly beautiful day with calm seas again. Six people have disembarked today on the small zodiac. They had to climb down a ladder from a door on the side of the ship to get into the zodiac boat. It took around 5-7 minutes to shuttle them over to the island. Everyone has been out enjoying the view and have taken lots of photos. We could see the kelp forests near the coast of Ile de Possession and a few penguins swimming in the water. The penguin rookeries were not full yet as they are only just starting to hatch from their eggs. The Doctor on board said that there was a report of a baby elephant seal being born there today. It is the season for their birth on subantarctic Island. So our position just before our departure from Crozet, now that all the transfer of people, mail and supplies have been completed, was 46°26’S, 51°54°E. Although sunny outside the air temperature is 5.1°C, while the sea-surface temperature has plummeted to 4.2°C. In other words it s now very cold and everyone has their big warm and windproof jackets on. The wind is blowing from the southwest at 15 knots. Our new bearing is now 106° and we are steaming away at 11 knots towards Kerguelen Island. Right now we are cruising past the very steep and rugged sides of Ile de l’est. It has clouds on the top of it but occasionally these break up enough for us to see the snow capped peaks of this dead volcano. Unsurprisingly, many people are up here looking at the stunning view and taking more photographs. So what is underway sampling? Underway sampling is where we can take sea-water directly from the ocean via a special PVC pipe which is specifically for the use of scientists. It is pumped from the front of the ship and then is passed through different laboratories. Essentially, we can turn on a tap and have water direct from the ocean on demand- as such then uncontaminated by metal pipes or other water systems. In this way when see something interesting on satellite or sonar or a drop in sea temperature we can then take a water sample to check it out without having to stop the ship. As I mentioned before we are doing his sort of surface water sampling as we pass through the increased regions of chlorophyll that the satellite has picked up while we traverse the Crozet region. In the next 24 hours we will have a few more underway stations as we cross the second branch of the Crozet bloom and then another CTD station for the carbon dioxide group (This group is called OISO (Observations Indian Southern Ocean)- pronounced wazso). More again tomorrow. It was a rough ride last night. I’m not sure that many of us got much sleep. My bunk bed lays cross-wise to the length of the ship and so I had the impression that I was on a swing most of the night- head in the air for a few seconds then feet soon after, over and over again. I listen to music through headphones to distract me from focussing on this motion, it helps a lot. So it wasn’t surprising that everyone looked tired at breakfast this morning. So the seas have certainly changed as we approach Crozet Island. The wind now is 27 knots from the southwest. Last night the winds hit Force 8, which means they were between 35-40 knots. With all this motion we also get to hear things rolling around in people’s cabins or labs because they weren’t secured very well. This noise can be more annoying than rolling around in your bed when you are trying to sleep. I’m happy I have my music to listen to. Our current position this morning is 41°49’S and 52°33’E, our speed has dropped back to 10 knots and we continue along the bearing of 182°. The air temperature has dropped a lot in the last 24 hours. It is now a chilly 6.5°C outside - like a cold winter’s day in Hobart when I think about it. The sea surface temperature is warmer in comparison at 14.8°C and has hardly changed since yesterday. The swell is around 3-4 metres while the wave period is 10 metres. There have been a few waves at a height of 5 metres. Try to imagine or measure how high this is when you look at your school buildings. When the ship goes over these bigger waves we all know. There is a great big splash and surge over the wave as we ship goes over. This is actually quite relaxing to watch believe it or not. Today we have visibility to the horizon but the skies remain mostly cloudy with small patches of blue. I’m told the weather should improve through the day. As we approach Crozet there is a sampling station for the scientists studying the amount of carbon dioxide dissolved in the surface waters. We will arrive at this sampling station around 4am in the morning. I too will take a water sample from the water remaining from their CTD deployment. I believe that we will also trial the deployment of the phytoplankton and various zooplankton nets. So I will start working on my samples essentially from early tomorrow morning. It means another day in the lab making sure that all is in order and that sample bottles are labelled ready to go. I will also prepare an excel worksheet to start putting in all the data associated with taking my samples. This includes the location data (longitude and latitude), the name of the deployment, how much water I took, what I have preserved the water with, when I run the sample through the machine, a list of diatoms that I find when looking down the microscope and many other details. It will also mean that I need to get to bed early tonight in order to get up for the station bright-eyed and bushy-tailed. Following the station we will virtually steam a little and arrive at Crozet now around midday to drop off the bird scientists. PS. Happy Birthday to my MUM in Adelaide! It was too good to last those glorious first few days at sea. This morning I woke to rain on my window. The sky is an enveloping grey that meet the sea all around the ship, unsurprisingly the humidity is 93%. It is raining a little but our visibility would be around 4000 nautical miles (multiply this by 1.852 to have this distance in kilometres). The sea is still relatively calm. Our current location this morning is 38°22’S and 53°20’E and we continue under a bearing of 182°. Our ship’s speed is 12 knots, and the period between the waves has shortened to around 20 metres, the swell is around 1-2 metres. I sense that there is more of a roll to the ship today. The ship’s Lieutenant on duty this morning, Flavian Rode, tells me that this afternoon we will stop again to test the trace metal rosette deployment and while the ship has stopped he will be testing their new zodiac. They will use the zodiac to ferry the scientific staff from the Marion Dufresne across to Crozet Island when we arrive on the 15th of October. The wind is blowing at 8 knots from the south. I guess the biggest change from yesterday in sea conditions are seen in the air and sea temperatures, these have decreased to 11.1°C (air) and 14.9°C (sea). As I look across the bow of the ship now I see a wandering albatross gliding across the waves. They fly around a 1-3 meters above the waves. It is really quiet impressive to see. Yesterday, there were three species of albatross seen off the rear deck and a few petrels. There is a small group of scientists on board who are watching for sea birds and whales up on the bridge. They won’t be staying on board for the full duration of our mission as some of them will be disembarking at Crozet and others at Kerguelen where they will work studying the sea birds for between 6 months and 1 year. They tell me that while they are on the ship they document the sea birds they can see for 10 minutes each hour and also at sunrise and sunset. Yesterday we finished preparing the phytoplankton net with all its ropes and weights (there will be a photo of this posted on the photos page in the near future). We just need to put the large plastic box in which it will be secured between sampling stations in a special spot out on the rear deck today and then we will be ready for this sampling of the phytoplankton when we arrive on station. Most of today I hope to go through the various sampling procedures with Veronica in our lab. There is still a few things to set up and organise. I will also try to obtain another water sample from the ship’s in-line pipe to test in the FlowCAM, although there is very little in terms of phytoplankton in the water at the moment via this method in this region of the ocean. Still it will be worth another go just to play around before arriving at Crozet where there should be more. How do know there will be more? It is because we receive satellite images of the chlorophyll content of the ocean’s surface (courtesy of an oceanographer on our team, Dr Francesco d'Ovidio, who prepares the images for us) and we can see that there is higher levels of chlorophyll near Crozet than where we are now (I will try to send an image of what this looks like in the next few days). We haven’t seen much in the way of animal life for the moment. Not many birds yet, one or two skuas and apparently someone noticed a whale spout of water early this morning but in the distance. Today is a special one though for one of the Australian team (Fabian) as it is his birthday. He will no doubt have a cake at lunch and probably a small party tonight in the bar. There are still many meetings happening on board to make sure that each group is coordinated and everyone understands who will be working on each type of sample. For example we had a meeting for the sediment group this morning to talk about where our sample stations will be in the next few weeks, where we would like any additional samples if time permitted, how the sampling procedure would be undertaken and the sampling order. As there are 5 people interested in working on the material collected we also need to make sure that we agree on how the samples are shared between us so that eventually we can combine our results and therefore get the maximum information about what the seafloor is made up of from both chemical and biological components. My part in the sediment study is to look at which diatom frustules (the silica skeleton of the phytoplankton) actually make it to the bottom of the ocean so that we can make a map of the dominant species on the sea-floor. My other colleagues will look at the chemical composition of the sediments and how much oxygen (an indicator of bacterial activity) is available. The map I produce specifically with respect to the skeletal remains of the diatoms found in the sediments helps us to link in with all the diatoms living in the surface waters with the aim of making a special link between one or two specific diatom species that represent this region. If I can establish this link then I can start to look for these signature species in longer fossil records (that is long cores from the sea-floor) and relate this naturally fertile region today with similar events recorded by the fossils trapped in the sediments in the past. As such it is a long-term project that I have to build-up starting with the sea-floor samples. Currently I work with a French researcher at the University of Bordeaux (Dr Xavier Crosta) on building the database, in 2005 under the KEOPS 1 programme we added 5 samples from this region, this year I hope to add another 3-5 samples. In the long-term, again working with Dr Crosta, I hope to be able to take long cores from this region to determine past events of natural fertilisation or pauses in this pattern to assist with understanding the how the biological productivity of the ocean changes over time. I’m heading off to Lunch- not sure what is on the menu today (aside from birthday cake). The rest of the day I’ll continue to prepare the phytoplankton net and go to another meeting for the water sampling on the CTD instrument. Veronica is now up and about which is a good thing. We continue our journey to Crozet Island. Today we have sun on the sparkling sea. It is so calm that the crew are doing general maintenance on deck. Our course is 185 degrees and the speed is 12 knots. Our position is 28°47 ‘S and 54°14’E. The wind is still from the east (87°) but the wind speed has dropped to 15 knots. Outside the air temp is 18.1C while the sea temperature is 20.1°C. So only a small change from yesterday’s conditions. There is a long ground swell from the southwest, and the waves are around 300 meters apart. It is a comfortable ride on the sea at the moment. The wind appears to be building though and everyone knows these good conditions are not going to last. Some good news on the people who were sea-sick, they all appeared at breakfast this morning which is a good sign that they are getting their sea-legs. Veronica was one of these smiling faces this morning. She even tucked into some Vegemite on toast. The chief mechanic on the ship is Richard Marie. I will try to get some information from him about the engines in the next few days. Yesterday’s short stop to test the trace metal rosette deployment into the sea showed that more weight would be required to make the Teflon cable sink. So today at 10 am they will try again. Yesterday for lunch, which is the main meal of the day on the ship, we had a salad for entrée, “Shop Suey” for the main course, a large selection of French cheeses and then crème caramels that were delicately organged flavoured. After dinner some people played on the tabletop soccer (“babyfoot” in French) while others played badminton in the forward hull, and I know that Diana Davies played her accordion (actually it is a concertina) in one of the hull containers. Today I am working on setting up the phytoplankton net with my French colleague (Vero Cornet-Barthaux). I hope to be able to test it’s deployment in the next few days when we are closer to Crozet Island. Yesterday we set sail from Reunion Island at midday. A day later than planned due to a flight delay from Paris that contained some of scientific personnel heading to Crozet Island who will study penguins over the next few months. We had a clear skies and good weather to head out into the Southern Ocean. Unfortunately some people did get sea-sick on heading out, including our Veronica, but they are being cared for by our doctor on board. They will be up and about in a few days once they get use to the motion of the boat. We have also had our security meeting and abandon ship drill yesterday, which is always entertaining when people have to try on their special survival suits. We are currently heading towards Crozet Island and this morning we were at 24° 53'S, 54° 42'E , heading south on a bearing of 186° and we are doing a speed of 11.8 knots. The seas feels relatively smooth, the swell is around 2 - 2.5 meters. The skies are a little grey. Outside the temperature is 19.7°C and the water temperature is 23.7°C. The wind speed is at an average of 26 knots from the East. The Captian tells me that we will reach Crozet on the 15th October, so a few days on from now. On the way down we will stop once or twice to collect some samples for the trace metal scientists and the other for the scientists studying the draw-down of carbon dioxide into the surface waters. One of these stops will be today and there should be another a little closer to Crozet. At this stage all the scientific staff are busy working on setting up their lab spaces and making sure that their equipment is ready for the first station in a few days time. This means a lot of unpacking and then tying down of everything. So lots of ropes and tape and velcro on anything that can not be screwed down. Once we hit heavier seas, the things we think are OK for the moment (such as computer keyboards) will end up on the floor. We will also have our first scientific meeting today with our Mission chief and scientist (Professors Stéphane Blain and Bernard Quéguiner), this will outline the programme and operations that will occur and all sort of other information related to the way in which sampling will proceed.They will also inform us of the codes we should follow when labeling our samples. At this stage in my own lab, there are three microscopes set up (one dissecting, one inverted and one fluorescent) plus my FlowCAM. All of these are tied down. Today I will start testing the operation of my FlowCAM and hope that all goes well. Yesterday we set up all the boxes with dividers in which we will put the samples and then sorted out where all the bits and pieces for sampling are kept. We also put all our wet weather gear in a place ready to change into - the last thing you want to do is return to another place in the ship to look for your wet weather gear when you need to collect your sample outside. Reunion Island - an old and new volcano in the Indian Ocean. The Australian team have all arrived on Reunion Island over the last few days, flying in direct from Sydney via the very pleasant Reunion based Air Austral company. The weather has been very kind to us with warm tropical days around 26°C, which has in turn allowed us to get about the towns of St Denis, St Paul, St Gilles Les Bains and Cilaos, while shaking off jet-lag (there is 7 hours difference between Eastern Australian Standard Time and Reunion). 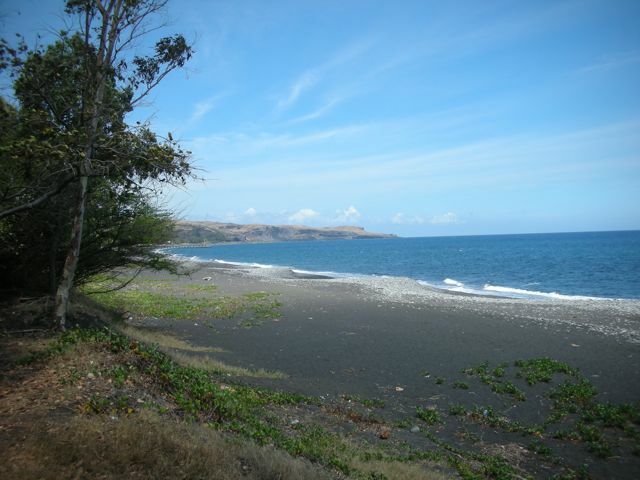 We have experienced very friendly people and some different local dishes and tropical fruits. The pineapples are especially sweet and the odd french pastry and cheese has been appreciated by all. 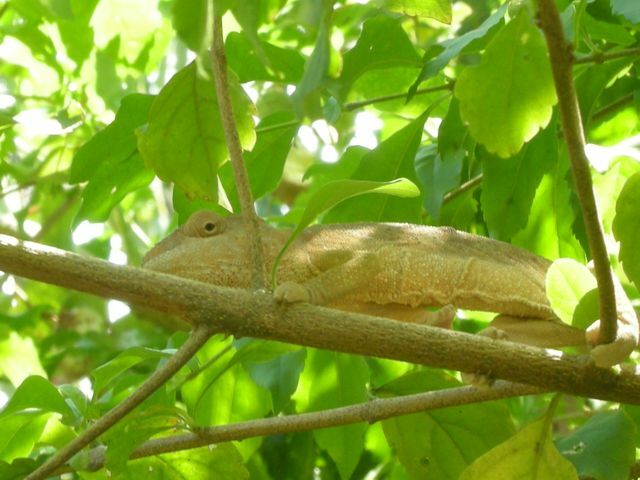 Some of the highlights of the group have been seeing chameleons in the wild, the view from Cirque de Maido and the black sandy beaches. Tomorrow we head to the ship at Le Port to start our preparations for the voyage departing on the 8th. There is of course always last minute things to seek out from the local shops, especially when you start thinking that you are at sea with no shop around the corner for the next two months. High on our list is of course chocolate, but then there is also the need to think carefully about washing powder, toothpaste and shampoo that one needs to bring along as well. The next instalment will come from the ship and detail the departure from Reunion.